We don’t get the same school holidays as school teachers do so I am still working all summer but at a nice relaxed pace with lots of weekends free now. As I am still having a bit of pain in my wrist I am avoiding knitting and too much machine sewing so am embarking on a few embroidered pieces. 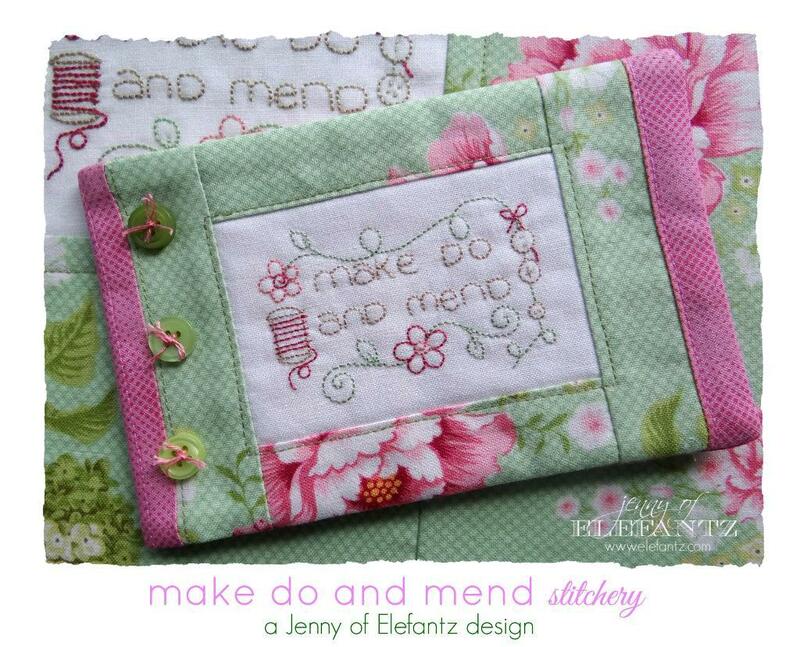 I recently found Jenny’s Elefantz blog and embroidery designs, cannot remember how but think it was a link from another blog and she designs the most wonderful things so I had to go and buy some patterns. Some of these will be stitched for me and some will be gifts. This will be my first project which I am starting this afternoon and I have the perfect backing for it in my stash. She is an amazingly talented and generous designer as she has loads of freebies on her site as well. 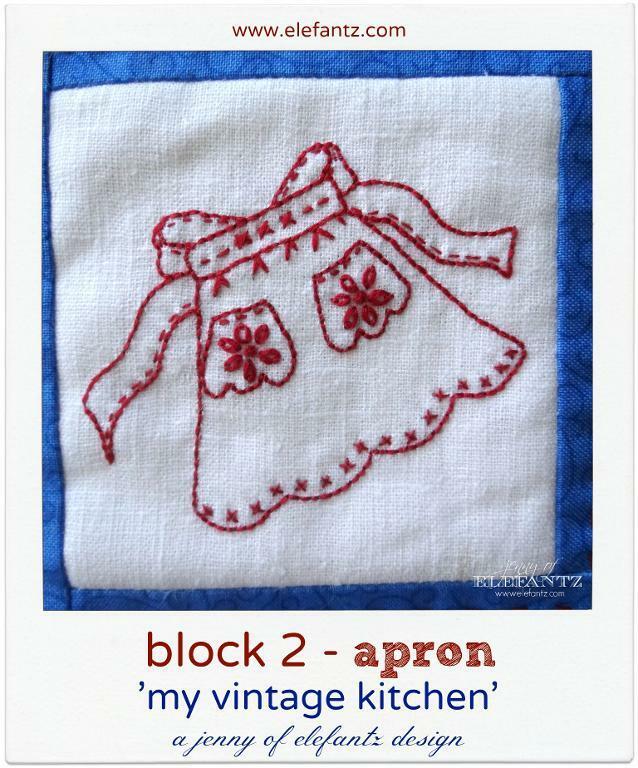 She has done so many lovely free block of the month sets over the years and currently has a Vintage Kitchen series. Look at these beautiful designs. Not only are the designs really lovely but they use very simple stitches, most are backstitch or satin stitch but she makes the most gorgeous things with the embroidery. My embroidery skills are limited, I would love to learn more complex stitches but for now I don’t have to. 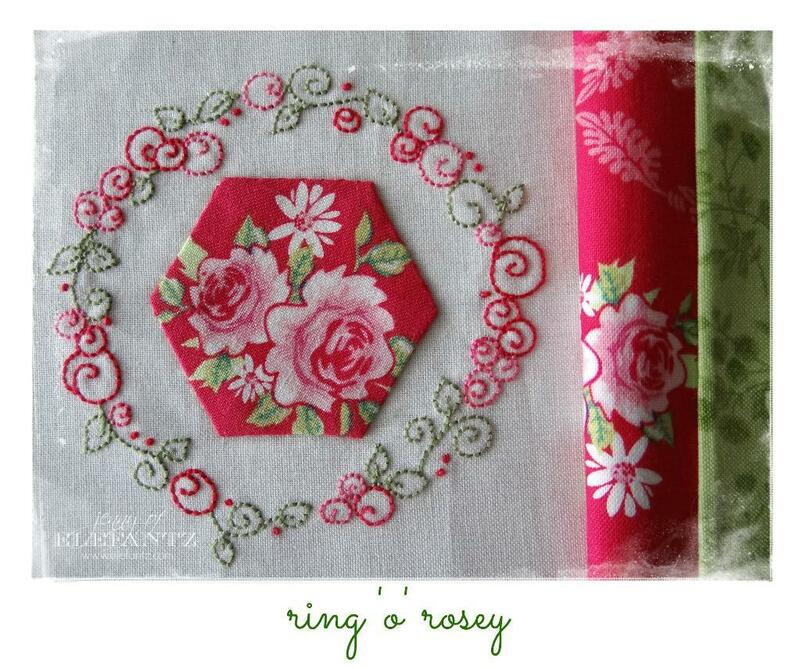 I love the fact that she combines stitching with applique and quilting and I was also very impressed with this design which combines my hexi love with beautiful roses. 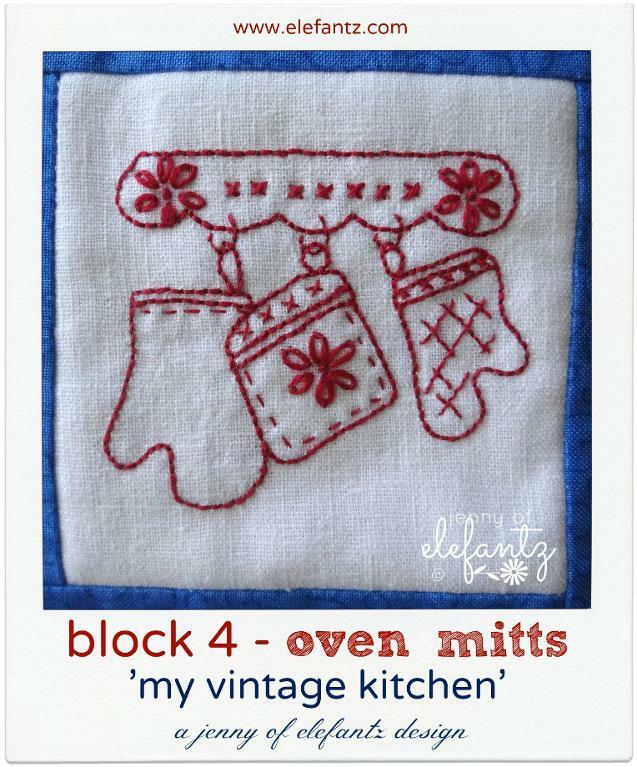 She also posts pictures of what people make with her designs on her blog and that gives you loads of ideas for different colourways.Here is the link to her Craftsy store if you are interested, they would make lovely Christmas presents for stitchers. She also has a monthly Stitchery Club and I am seriously tempted to subscribe to that, even I don’t do all the designs now I could consider it part of my retirement fund! Also it is nice to support fellow designers and craftspeople in their business endeavours, I love knowing the person behind the work, that is one of the lovely things about buying re-enactment goods it is very personal shopping. I am also enjoying reading all about her life in Australia, I have decided to read all her posts from the start in 2009. I quite often do that with interesting blogs, to me it is like reading someone’s autobiography and I love seeing other places around the world. I have been a long time follower of Katrina in New Zealand’s A Kiwi Stitching blog which is great for a mix of stitching ideas and photos of the beautiful places around her home and of Mary Kathryn’s, Impie, Hattie and Bea blog and webshop, she lives in the Rocky Mountains and posts beautiful photos of her surroundings. I have recently found another Colorado blog Tanya Quilts in Colorado , she is a very creative and very prolific quilter who amazes me with her output. Another new one for me is Anna Scott Embroidery, lots of beautiful goldwork here that she designs and sells patterns for and pictures of the Australian vineyard where she lives. Here in the UK I love Julie of Little Cotton Rabbits knitting designs and her garden and walk pictures, she is a really good photographer and of course the animals are amazingly cute. I have the patterns for some of the latest to make when my hand is better, she now has mice and cats to knit as well as rabbits, elephants, foxes and monkeys! I also really enjoy Helen from Hen House’s vintage style quilts and collectibles and her trips out in the South of England, she loves the 1940s and often visits events and vintage fairs in costume which looks fantastic. I really enjoy blogs that combine beautiful crafting with information about life in other places, a bit like having lots of pen pals around the world. Although I don’t comment on people’s posts very often I do love the sense of being in touch with fellow knitters, stitchers and quilters. That is one of the best things about the internet, the sense of community that it gives. As well as the opportunity to buy cute things of course 😉 , I may just have indulged a little bit in some charm buying recently, will let you see what I have been acquiring soon. Right there appears to be sun in Yorkshire, (a minor miracle), and the washing machine has just finished so I will make the most of it and see if I can get some stuff outside. Not to tempt fate but it may be 20 degrees and dry today which is great for August round here! Thanks as always for visiting and I hope that you enjoy reading my blog as much as I enjoy visiting all the others. 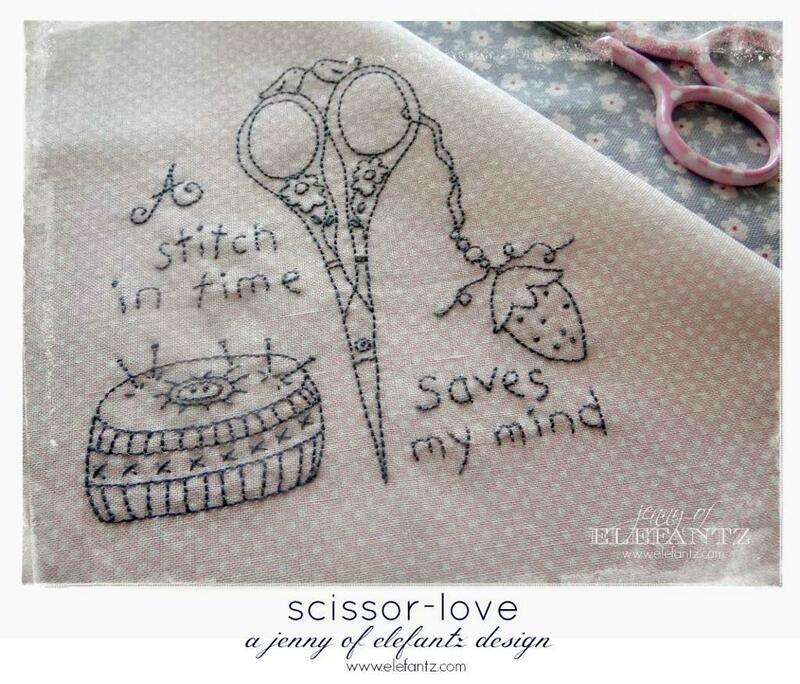 I love the scissor embroidery!!! 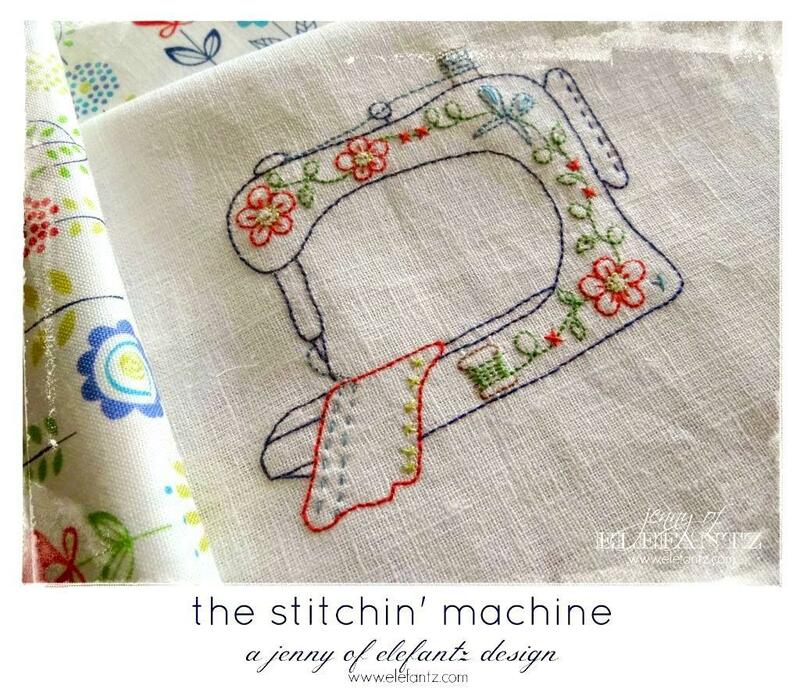 I know it is so cute, I will possibly make a lot of these for stitching friends – can’t wait to get started later this afternoon! I’m looking forward to seeing your embroidery !! I love the sewing machine. It was fun clicking on all the links you shared and seeing all the pretty things…lots of inspiration and ideas. Thank you! Glad you enjoyed the links, I love all the inspiration I get from other people’s blogs. 20 degrees and dry? Why is life so unfair? It’s been raining for a day and a half here! I spoke too soon, rain from 4pm ha ha! Yes there is lots of scope with the designs for adding charms and beads as well.